The hard-hitting Londoner has spent the past two years spitting on underground beats. Now she’s ready to spread her wings. The fast-paced lifestyle and near-constant rain of the English capital soon seeped into Flohio’s psyche and, eventually, her music. 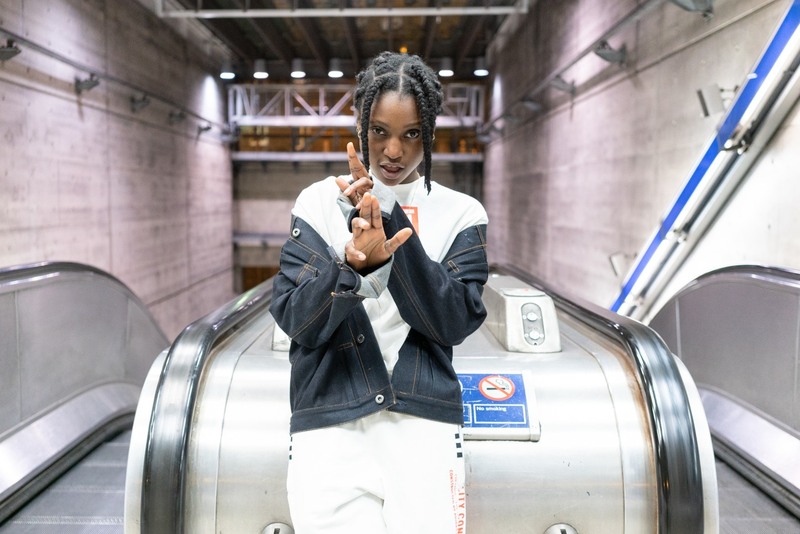 Today she raps with great clarity over a hybrid sound drawn from the U.K.’s most forward-looking underground cultures, equally adept at going in on an old-school grime beat as she is at working with boundary-pushing electronic producers. She first broke out in 2016 when London producers God Golony featured her on the bruising “SE16,” named after her south London postcode. 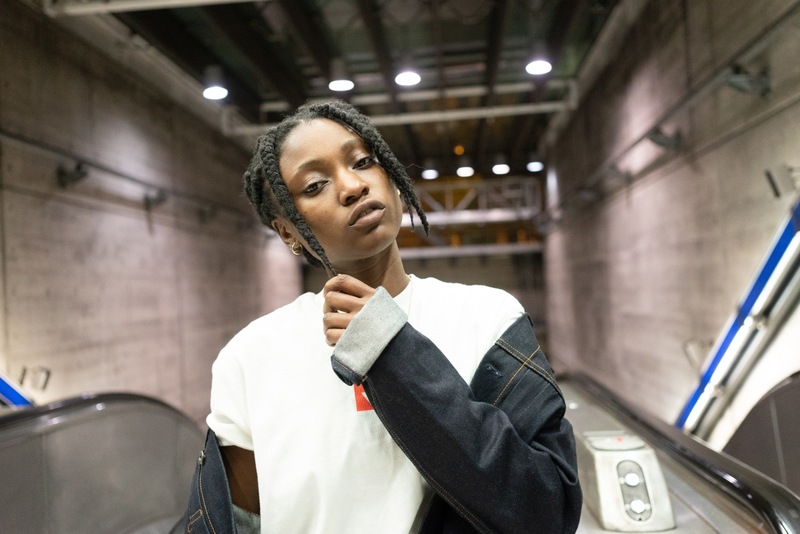 She then teamed up with the production duo again a year later when she appeared on “Fights.” This flurry of activity, alongside a collaboration with Night Slugs co-founder L-Vis 1990, established Flohio as a serious talent. As she explained during our interview in early June, avoiding classification while repping her city is what means the most to her. What inspired you to start rapping? I heard somewhere that Eve played a big part in it. I wasn't that open to music when I was younger so I didn't really have many influences around me, but my sister was into fashion. Back in that day Eve was going through her crazy hairstyle phase and I came across her CD in my sister's room. When I played it Eve was rapping and I was like, “This is kinda cool.” Then I came across 50 Cent, Lil Wayne, and everyone else. That was when I was 12 or 13. Did your parents play a lot of music, growing up? Yeah, my mum played a lot of music that was more gospel and old-school Fela [Kuti] and afrobeat. My dad played different types, like Celine Dion and just different vibes. But I wasn't really taken in by them. I was more into sports and playing PlayStation. How do you think south London is represented in your music? I always say south London people have this certainness about them. They're gritty, man. They're forward with it, you know. You're bold, you're loud, which is not me. Yeah, I don't know what it is but I don't even try to force it in my music. It just comes out, it's how I've been raised. It's good energy. Do you remember the first bars that you wrote? I was in the youth club and back in those days we would just make so many songs. From the moment I could come up with a chorus and a verse I was ready to go. I would probably have been there two days a week, Wednesdays and Fridays. I had no reason not to be there. When people talk about gang violence and crime in London youth centers are often held up as a solution. How big a role do you think yours played in your career? The culture is so massive now, and everyone wants to step in. But these kids can't afford studio sessions. Studio sessions are expensive. £50 an hour... it's some crazy prices. My youth club cost, like, 50p for a whole day. It's a good environment; no one's pressuring you. You're learning and you're creating with your friends. That helped me a lot, and a lot of my friends. A lot of my friends were bad kids as well. But rather than them being outside or in the blocks on that Wednesday night you catch them in the studio. It's different now. So many have been shut down and the ones still open have had their facilities cut down. I wish I could give my time to youth services. I feel like I could do a lot more. One of the things that always strikes me about the music you've put out in the last couple of years is that you're a really good selector of beats. What are you looking for in a beat? It has to move me. When I hear it [the right beat] my brain just can't stop. It's just a thousand words. Even if it's just hi-hats playing on a loop I can see where it is going. In terms of production you kind of gravitate more electronic sounds. What's drawn you in that direction, and is that something you see yourself sticking with? It varies from the up-tempo, electronic dance music to something more heavy-hitting. The new music I have coming out, you'll be able to hear the difference. When I started working with [London producers] God Colony on “Steady” and “SE16,” that was me just stepping my foot in the waters. I was new to that whole electronic sound and I liked it. But I also like hip-hop and I like grime. I don't want to lose that. I love to merge things together. I don't want to say I could do anything but I could easily flow on different genres, different tempos. It just has to be some sort of angelic, alien sound that gives me space. That forces me to move outside the box. That's why it's so jarring when [people call my music] grime because it's like, Really? It's not grime at all. When I hear that it's like, I'm going to show you guys. Is the idea of standing apart from the crowd important to you? Yes because there's a lot of factors there. One, there is the way I look. Nails, makeup, nice dresses — that's not me. I'm more open with the way I dress, I'm androgynous with my style. Back in the day that was not easy. People wouldn't digest that too well. My family, and friends, people around me would be like, “Look at how you dress and how you look, it might not go down, the dream might not happen.” I was just like, “What! ?” That really hurt me, man. Whereas now, this is where I want to be. I just want to do it like Missy, but modern. My sound has got to be so good they ignore everything else. “WATCHOUT” is the most recent thing you've dropped. On that you talk about people who are taking shots at you. Who are you talking about there? The songs are usually just bigger than me and it's all metaphors. So it’s people that want to stop me from being where I want to be, either systematically or the people close to me. There are all these barriers in front of me. What do you think is the biggest barrier between you and what you want to achieve? The biggest barrier is that I’m black and I’m shy. I’m confident with my music but outside of it I’m a mess. So I feel like people are going to take advantage. Especially these big men, you know? I feel like I’ve got to go back and read up on things, too. Otherwise I’m a barrier to myself. The more knowledge that I have the more interesting my music will be. We talked about your lyrics earlier. Who are the lyricists you most admire? When I first started out Lil Wayne was the first person I came across. He’s got crazy metaphors. His cockiness was what I took from him. Then I came across Childish Gambino and he made me want to change how I write. When I heard “Freaks and Geeks” I was like, “Yo this guy is sick.” It was different from the other rappers: he wasn't wearing no chain, none of that. He just had a red hoodie and I'm like, “Who is this guy?” I was drawn in. I think before that I didn't really understand rap. Everyone would talk about JAY-Z but I kind of find JAY-Z boring. There was nothing that made me think. Not until I came across Childish. Then I'd listen to Kanye and J Cole. Do you think you identify with those kind of outsider figures who operate in the rap world, but don't necessarily feel like they belong there? Yeah, I’m interested in people with their own story to tell, for sure. What’s next for you? What do you have coming up for the rest of the year? I’m going on tour in September, which I'm excited about. Once I come off the road I'm going to get into the studio and then start figuring out a project. I want to put an EP. I feel like I’m ready now. I want to be able to put something out that I'm really proud of. I want it to sound like a mix of “Watch Out” and “SS16.” Imagine those two having kids.